Spencer doesn’t have a choice. He can't choose to be different than what he is—the son of the town's worst enemy, the weakling who can't stand up for himself, the loser without friends. He can't change the way things are. These are the things Spencer believes he needs to fix his life, and that is what the steroids promise—a quick fix. But promises can be broken and shortcuts are often treacherous, and Spencer must decide if those risks are worth the perceived rewards—if “artificial” hope is strong enough for him to be fixed, by force. When I had first received this book after winning it in a giveaway on GoodReads hosted by Jason Warne himself I wanted to read the book just to expand my literary boundaries but hadn't expected to be super impressed. However, I stayed up until 2 o'clock in the morning to finish reading this book, that pretty much speaks for itself. 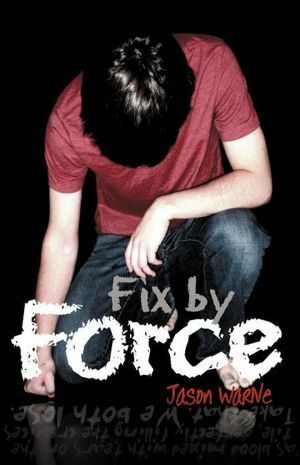 Fix by Force was definitely enlightening about the psych of someone on steroids or considering steroids. Prior to reading this book I just assumed that the only people who took steroids were egotistical meat-heads, but Jason Warne's story told me otherwise. Spencer has low self-esteem, feels disconnected from everybody, and hates being compared to his father; the town's enemy. What I really liked about this book was how it went against stereotypes; the steroid user wasn't the already big quarterback who just wanted to bulk up more, or how the new-start school Spencer went to wasn't filled with only delinquents, there were also students who just made a dumb mistake. When Spencer goes to the New Start school and is in a new environment he starts changing, getting violent, throwing punches for almost no reason but it isn't because of the influence of his peers it's because of the steroids. I really liked this book a lot more than I had expected to, Spencer was a believable character and at times really relate-able, going through high school and feeling like you just don't fit in or having bullies. Jason Warne's writing style was great and I found myself thinking 'this is an awesome book, I'm gonna have to check out other books by this author.' At the Dodge scene (don't worry no spoilers) I almost started crying, not just because I'm such a crybaby but because Warne knew how to captivate that moment and the emotions that Spencer was feeling perfectly. I recommend this book for any teen or adult, it's perspective-changing and can teach you a thing or two about how to perceive others and about the consequences of trying to fix everything by force.